An excellent history for even experienced historians regarding World War II in Europe is the "Report by the Supreme Commander to the Combined Chiefs of Staff on the Operations in Europe of the Allied Expeditionary Force". This document covers 6 June 1944 to 8 May 1945. As you read this narrative given by General Eisenhower on 13 July 1945, we will add to, illustrate and connect the visual to the units and their history as they participated in events contained herein. Experience military history on film as you order video dvds from Combat Reels and follow the allies across the continent in Europe. Dwight David Eisenhower was appointed as the Supreme Commander of the Allied Expeditionary Force ("SHAEF") in February 1944 and he received the following orders dated 12 February 1944..
4. Command. 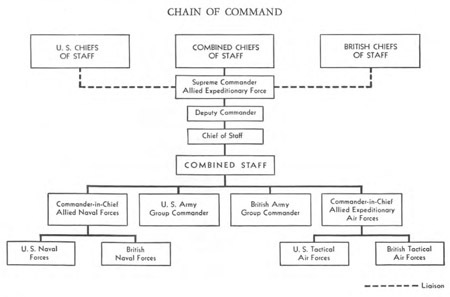 You are responsible to the Combined Chiefs of Staff and will exercise command generally in accordance with the diagram at Appendix [reproduced on opposite page]. Direct communication with the United States and British Chiefs of Staff is authorized in the interest of facilitating your operations and for arranging necessary logistic support. 7. Relationship to United Nations Forces in other areas. Responsibility will rest with the Combined Chiefs of Staff for supplying information relating to operations of the Forces of the U.S.S.R. for your guidance in timing your operations. It is understood that the Soviet Forces will launch an offensive at about the same time as OVERLORD with the object of preventing the German forces from transferring from the Eastern to the Western front. The Allied Commander in Chief, Mediterranean Theater, will conduct operations designed to assist your operation, including the launching of an attack against the south of France at about the same time as OVERLORD. The scope and timing of his operations will be decided by the Combined Chiefs of Staff. You will establish contact with him and submit to the Combined Chiefs of Staff your views and recommendations regarding operations from the Mediterranean in support of your attack from the United Kingdom. The Combined Chiefs of Staff will place under your command the forces operating in Southern France as soon as you are in a position to assume such command. You will submit timely recommendations compatible with this regard. 8. Relationship with Allied Governments-the re-establishment of Civil Governments and Liberated Allied Territories alld the administration of enemy territories. Further instructions will be issued to you on these subjects at a later date.